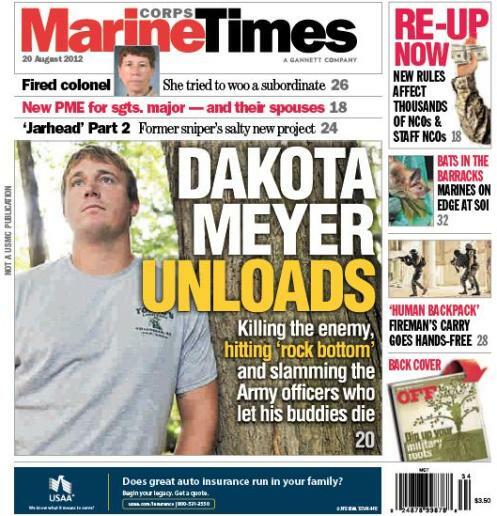 Last week, I reported for Marine Corps Times that Medal of Honor recipient Dakota Meyer acknowledges in his new book that he attempted to kill himself in 2010, one year after surviving the battle that led to him receiving the nation’s top valor award. The story generated a wide range of reaction from readers. Some blasted me for writing a story specifically about Meyer’s struggles, even though he chose to speak about it freely in an interview and disclosed the suicide attempt in his forthcoming book, “Into the Fire: A Firsthand Account of the Most Extraordinary Battle in the Afghan War.” Others praised the story and Meyer’s willingness to share his struggles, saying it may help other people to open up about coping with combat stress. 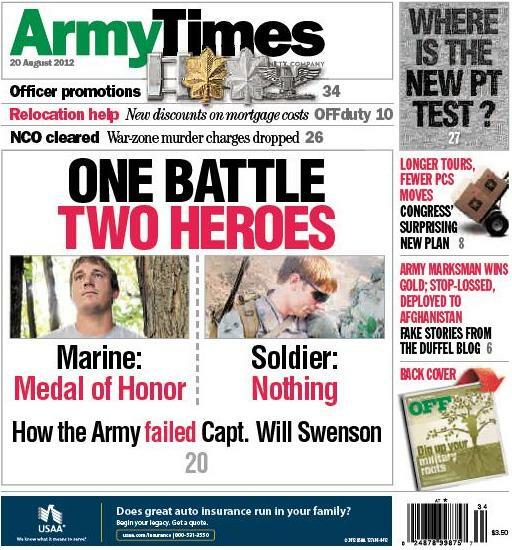 Today, Marine Corps Times and Army Times alike take it a step farther. In both papers, we outline a variety of details in “Into the Fire” and what it covers. Meyer pulls few punches in the book, especially when outlining what it was like being on a battlefield under fire for hours while officers in a nearby tactical operations center repeatedly denied fire support. With the assistance of his co-writer, author Bing West, he also lays out how the Army botched a Medal of Honor case for Will Swenson, a former Army captain who fought alongside him in the battle. In Marine Corps Times, Meyer also discusses what it’s like living with the Medal of Honor. It’s a complicated world, he says, in which many organizations request his time and celebrity and he must deal with “antagonists” who question whether his actions in the Sept. 8, 2009, battle in Ganjgal, Afghanistan, have been portrayed accurately. The book hits shelves on Sept. 25. In coming weeks, it seems likely that you’ll hear plenty about it on national television and other media outlets. The US Army has NOTHING to do with the Army Times, same with all the other Times Papers. Just saying. I hope he can find peace. study the battle. the Army Times won’t be as rough on the Army as they should. trust me on this. i’m sure you’ve seen privates court martialed for lesser offenses than what the officer at the command post allowed to happen on that day. The Battle of Ganjgal has allot of secrets and cover ups, why is there still NO JUSTICE, for Dakota, Cpt Will Swensen, Ken Westbrook, Aaron Kenefick, James Layton, Mike Johnson, Edwin Johnson, and others on the ETT 2-8 Team along with many Army brothers that wanted to aide in the recovery of the fallen heroes…These Army men were told by the MAJOR in charge that day the same Major who denied fire support and air support, the same Major that is NOW A LT COL, and is the only person who escaped any reprecussions….NO REPRIMANDS, in fact he received the Meritorious Medal Award!!!!!!!!!!!!! As a family memeber of one of the fallen Marines, we are DEMANDING JUSTICE AND THIS STORY IS ONLY THE BEGINNING!!!!!!!!!!!!!! I cannot wait for this book to come out… I know his book will show just how major an effect PTSD has on our military!